The 2010 Vuelta Espana got off to a spectacular start last night under the street lights and scorching heat of Sevilla. Most significant was the fact that HTC-Columbia won with a relative ease and that Mark Cavendish took the race-leader's red jersey. Why was that so significant then? Because the Columbia team contains at least three top contenders for the World Road Championships that start two weeks after the Vuelta ends. Cavendish and his teammates, Matt Goss and Bernhard Eisel, will play a crucial role in the outcome of the World Championships, and the fact that they beat sprinting rivals like Tyler Farrar, Alessandro Petacchi, Thor Hushovd, Filippo Pozzato and Allan Davis by a decent margin will send shivers down everyones' back. Sprinters are meant to sprint, just that, but Cavendish in particular has sent out a message that there's more to him that just a pair of fast legs. Much of the other news in Sevilla centred around the sudden closure of the Cervelo team, and the subsequent stampede to find places for riders and personnel, and for sponsors to suddenly contemplate a 2011 with no team or riders to endorse. There's more to the Cervelo story that might never come out, but it seems they have caught a cold by being the primary sponsor instead of a co-sponsor and bike supplier, as is the norm. The fact that they have twinned with Garmin for 2011 suggests their sudden departure wasn't thought up overnight, and that perhaps their cyclists have every right to complain about the manner in which they were, effectively, fired. Up to eight cyclists are expected to join Garmin-Cervelo, as the new team will be called, which in turn reveals a knock-on effect of present-day Garmin riders moving on the pastures anew. It's hard to imagine Farrar moving on from a team that's been so good to him, but one never knows, given that rival sprinter Hushovd is apparently on that list of riders joining. Yes, the Vuelta is happening, and happening right now, but it is the news around it that makes more interesting reading with the race barely on to the open plains of Andalucia. Aside from Garmin-Cervelo, the world of cycling is studying with amazement the growth of new teams in a year when it seemed the financial crisis might really start to hurt. Milram seems to definitely be a goner, but Saxo Bank, Caisse, Footon-Servetto and BBox have actually renewed or been salvaged by new sponsors. Incredibly, the Schlecks have decided to start their own team in Luxembourg and another team, Fly V Australia, is trying desperately to break into the ProTour ranks. I suspect that until the Cervelo news, both these latter teams had no idea how to gain the required level of talent to enable it to join the top-tier. Now they have the pick of some of the best cyclists on the market, and the sport seems as healthy as ever it was - what a funny world we all live in! 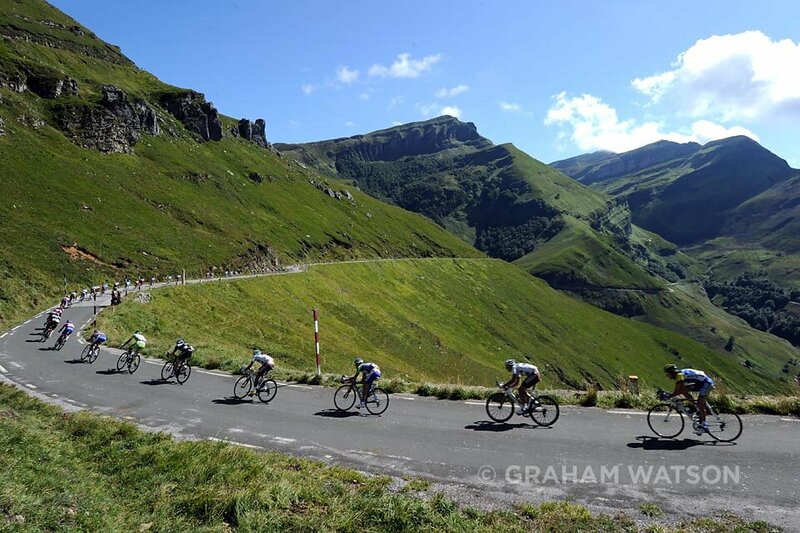 We will be doing daily up-dates from the Vuelta each evening, and the same updates can be seen on my iPhone app, GW Image Gallery, usually the very next morning. It's been a busy month since the Tour de France ended, but it was with great relief that I picked up my freshly serviced and cleaned cameras in Sevilla for another three-week reportage. Between doing the Tour I've prepared my 2011 Cycling Calendar, had a cycling holiday in the Swiss Alps, and then got to work preparing a huge photo-exhibition for the Geelong World Championships. "Eyes on the World" will take the spirit of my 2007 London exhibit to Australia on September 26th, giving visitors to the races a fantastic chance to see, and buy, some of my greatest shots. See my Twitter page for more details as they emerge, but essentially this will be one of the grandest exhibitions I've put on. So enjoy the Vuelta, but think also of the Worlds – they'll be with us sooner than you can realise!